We already ventured to the Winghart's in Market Square and we loved it! Guess how we felt about the second location in the Southside - we loved it! 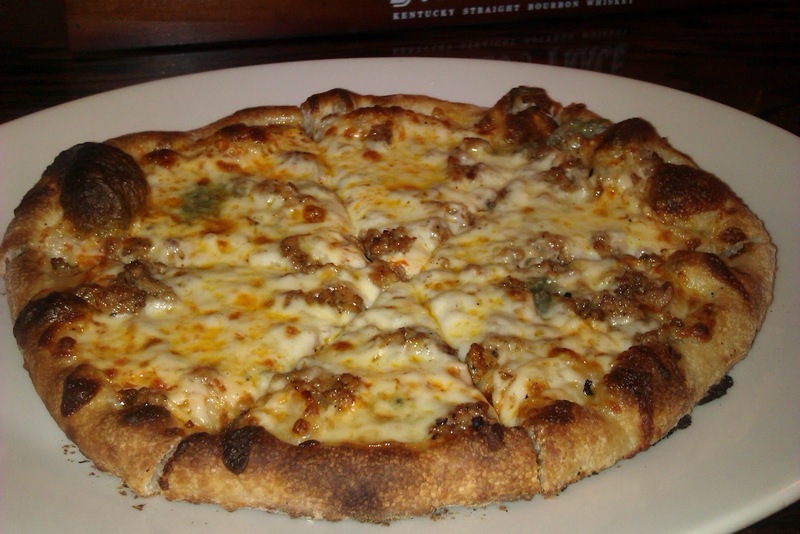 Pictured above is the tatonka pizza. Chicken, mozzarella, provolone, blue cheese and hot sauce. I enjoyed the pizza, but if you are going to Winghart's I have to recommend you stick with the burgers. The pizzas are good but Winghart's makes my favorite burger in the city - why question perfection by ordering a pizza or a salad? There are some great hamburgers in the city of Pittsburgh. Honorable mentions include Kaya, Burgatory and Tessaro's. 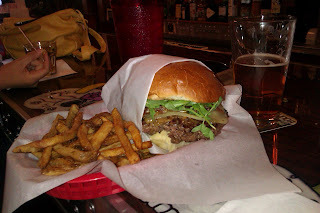 (Sorry BRGR, I still haven't made it to visit you yet.) However, I've found the burgers at Winghart's tend to have the best texture and my favorite toppings. The Shipwreck comes with arugula, onions, brie, bacon and white truffle aioli - pure joy on a bun. This combination is truly fantastic and if you are lucky you might even get to meet Shipwreck himself. As his name suggests, Shipwreck is a lot of fun and a little loose around the edges. Of particular interest in the new Southside location is the extensive draft beer list. Winghart's may very well have one of the top five draft beer selections in the Southside along with Fathead's, Smokin' Joes and Double Wide. The beers are separated by style depending on their location in the tap system - genius! One thing to keep in mind when ordering at Winghart's is that your burger will actually be served in the manner in which it is ordered. I typically like my burgers medium but I tend to order them medium rare at most establishments as I find that burgers are generally overcooked. If you order a rare burger at Winghart's, you will get a rare burger. Also, you may want to skip the fries. The burger itself is more than enough food to constitute an entire meal.